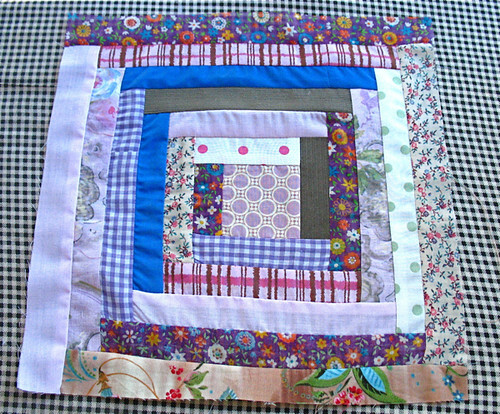 Scrappity scrap scrap - Stop staring and start sewing! I'm pleased to say I finished my December block before December ended (just barely,but hey!). Kristena sent me some sweet, eclectic fabrics to make a scrappy log cabin with and I was doing fine until I saw that she had thrown some corduroy in. My brain started yelling "Danger! Does not compute! Does not compute!" but I think I worked it out. I don't know what the big deal was, it sews just like everything else. I guess the idea of mixing it with regular woven fabric was just something I hadn't stopped to consider. 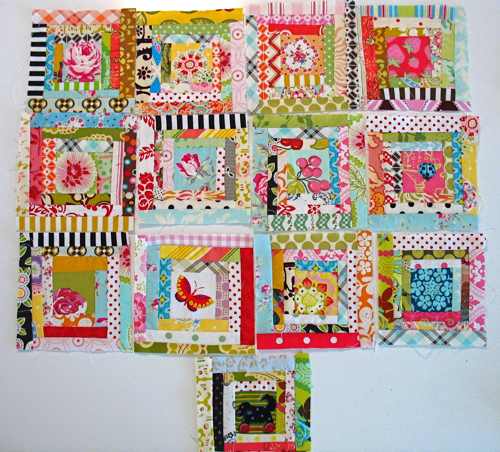 It was fun to use my last scrap of that Amy Butler fabric for the center and I added some Tracy Porter prints because they fit with the other colors so well. I hope she likes it! 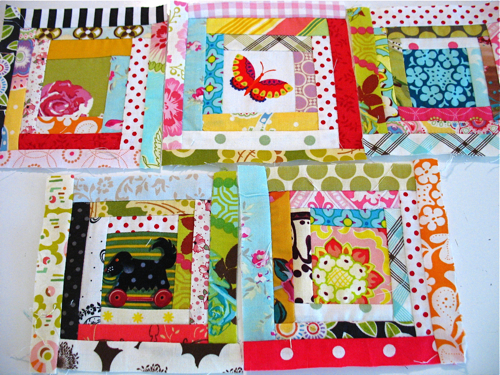 I think her quilt is going to end up looking like a brand new heirloom (that may be an oxymoron, but I think it fits). Here's our Flickr group if you want to see what we've come up with so far. I'm still trying to pick a favorite. Maybe the one with the dog in the middle. So I'm up to 13 now. I need to pick some new fabrics to add to my strips since I'm starting to see some repetition. But I'm happy so far. And I think I've finally come to the sad realization that I need to take my machines in for tune-ups. My serger is skipping stitches and I've tried everything to fix it. Since my favorite shop closed I just don't trust anyone. Will they take good care of my machines? Do they realize I need them back tomorrow (preferably sooner)?? Ugh. I've been thinking of ordering a bunch of Organ brand needles for my serger. Has anyone tried these? I'd love any help.